« OMG – Catching Is The Word! Feels Like Spring Is Already Here! Great weather we are having. Yesterday was in the 50s, today (Sunday) is in the 50s, and we are looking at at least 50s for all of next week. Might even see a 60s in there somwhere. Monday’s prediction is for some showers and there is a possibility of showers again Thursday (right now it is 40% chance). Generation has been off almost every day this past week. We have a low one generator running today, but the level is such you can wade in many places. The projection for tomorrow is no generating until late in the day. Table Rock went up two feet after this last rain we had. Fishing has been great! Dana had Richard, from Kansas, out for half a day. 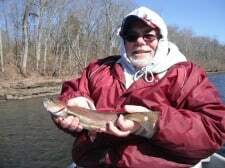 an especially good day for pulling almos any kind of streamer. Carolyn and a friend, Penny, decided to go fishing after Penny finished up with the fly tying clinic at the shop. Stripping was the word. Stripped the holographic red crackleback, the CQ streamer, olive filoplume (probably the best pattern), and finally a golden variant scuplin. Penny also caught several on the size 18 ruby midge. Says she is spoiled catching fish like it was fishing. 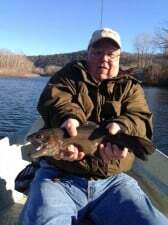 This entry was posted on Sunday, February 3rd, 2013 at 2:07 pm	and is filed under Fishing Reports. You can follow any responses to this entry through the RSS 2.0 feed. You can leave a response, or trackback from your own site.